The development of Australian Weeds. Factors affecting the crop tolerance and weed control of metribuzin in barley and wheat. Weed flora of various hill agro-ecosystems in Meghalaya, north-eastern India. B. Neogi and R.R. Rao. Brome grasses (Bromus spp.) as contaminants of barley grain in the Victorian Mallee. I.T. Mock and R.L. Amor. 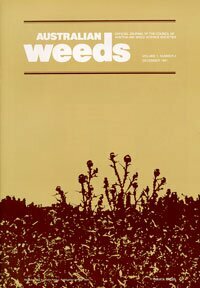 Australian Weed Societies - up to the eighties and beyond: Part Two: Australian weed science and weed societies in the eighties and beyond. 4. Verbenaceae - the lantanas, fog fruit, verbenas and snakeweeds: Part 2b The verbenas (conclusion). Distribution and importance of Noogoora and Bathurst burrs in eastern Australia. R.J. Martin and J.A. Carnahan. Allelopathy and self-defence in plants.